The Apple iPhone XS Graphene Series Anti-Radiation Flip Case is the only Smartphone case incorporating advanced graphene-based microwave shielding materials. Exclusively available at RF Safe, this G-Series (Graphene) case is priced at $69.99. Easy to use convenient RF radiation shielded flip cover design. 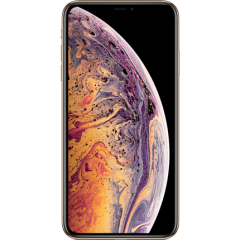 The Apple iPhone XS MAX Graphene Series Anti-Radiation Flip Case is the only Smartphone case incorporating advanced graphene-based microwave shielding materials. Exclusively available at RF Safe, this Apple iPhone Xs G-Series (Graphene) case is priced at $69.99. Easy to use convenient RF radiation shielded flip cover design. All SARs reported are averaged over one gram of body tissue corresponding to the US standard. The SARs may vary depending upon your specific cell phone network carrier (e.g., AT&T, Sprint, T-Mobile, or Verizon). The minimum separation distance for head and body-worn testing was 5 mm (about two-tenths of an inch). 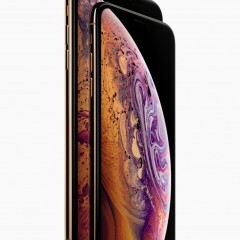 According to test reports filed with the Federal Communications Commission (FCC) ID BCG-E3218A, the Specific Absorption Rate (SAR) for the iPhone XS FCC ID (GSM and CDMA) for cellular transmission is 1.19 watts per kilogram (W/kg) at the head, and 1.18 W/kg when worn on the body. 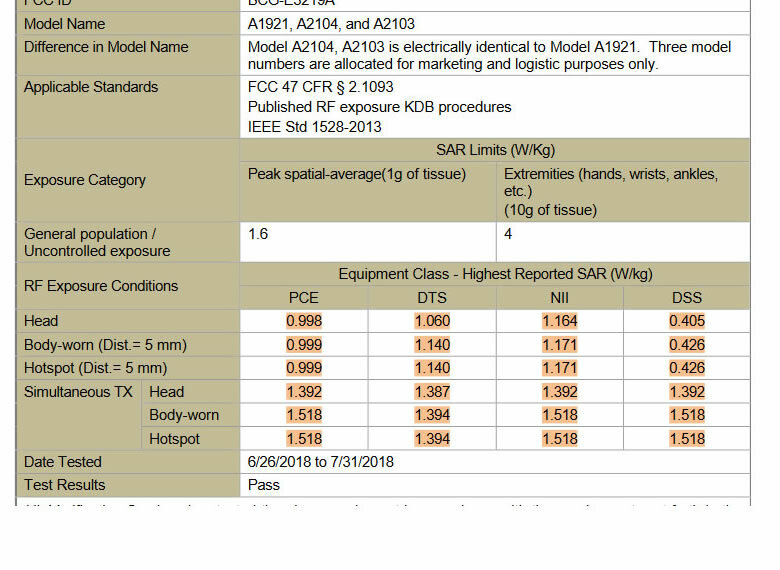 The highest reported Apple iPhone XS SAR levels during simultaneous transmission use conditions are 1.35 W/kg at the head and body 1.53 W/kg. A required minimum separation distance for head and body-worn testing is 5 mm (about two-tenths of an inch). According to test reports filed with the Federal Communications Commission (FCC) ID BCG-E3219A, the Specific Absorption Rate (SAR) for the iPhone XS MAX FCC ID (GSM and CDMA) for cellular transmission is 1.16 watts per kilogram (W/kg) at the head, and 1.17 W/kg when worn on the body. 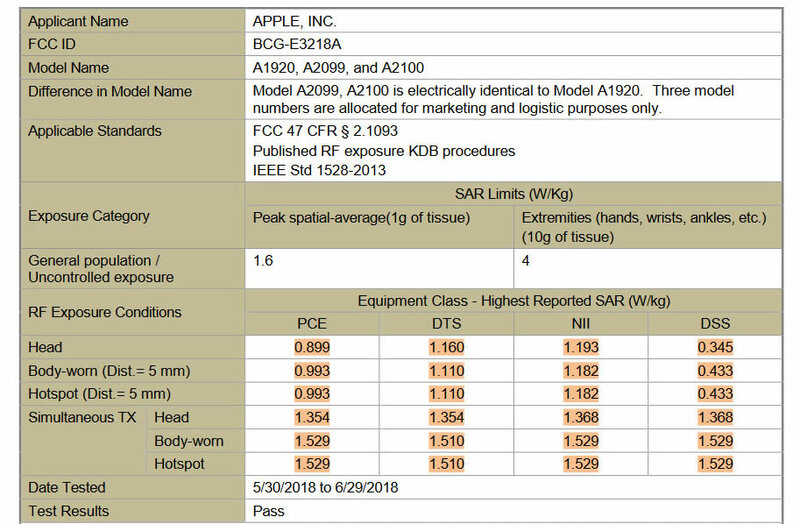 The highest reported Apple iPhone XS MAX SAR levels during simultaneous transmission use conditions are 1.39 W/kg at the head and body 1.52 W/kg. A required minimum separation distance for head and body-worn testing is 5 mm (about two-tenths of an inch). USA Legal Limit is 1.6 W/kg - FCC SAR testing is measured in watts per kilogram (or W/kg) averaged over ONE gram of simulated biological tissue. USA Legal Limit is 1.6 W/kg - FCC SAR testing is measured in watts per kilogram (or W/kg) averaged over ONE gram of simulated biological tissue.